If you are looking for the party scene in MA you should start by going to a club. From comedy clubs to dance clubs, we have your complete guide to the hottest MA clubs. These places are guaranteed to keep you partying all night! Enjoy a night out with your friends at one of these MA dance clubs. 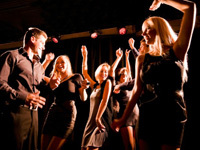 Step out onto the dance floor and get ready to have a great time at any of these Massachusetts dance clubs.